b) The numbers from 11 to 19 are composed of a ten and one, two, three, four, five, six, seven, eight, or nine ones. c) The numbers 10, 20, 30, 40, 50, 60, 70, 80, 90 refer to one, two, three, four, five, six, seven, eight, or nine tens (and 0 ones). Count, read, and write whole numbers to 100. Know 2s, 5s, 10s to 100. Move beyond the number 12 to teach the -teens, with glass gems as counters. Using a piece of newsprint paper, draw 10 large ovals (about the size of an egg) in a vertical column on the left, spacing them evenly. Then add gems to each one, 1 for 11, 2 for 12, etc. Replace the gems with color dots, and write each number and its word out on the right side. Have the child(ren) copy yours as you model it on paper or the board. Note that the words for eleven and twelve are different. Their origins go back to the early use of Arabic numerals. The word “eleven” comes from an Old English word meaning, “one left over.” And “twelve,” from a word meaning “two left over.” Except for thirteen and fifteen, the rest just add the suffix -teen to the number. Both suffixes -teen and -ty derive from the word “ten.” Try telling a story like this while showing it visually. Once upon a time, the numbers were happy to be a small family, from 1 – 10. They knew and understood each other very well, though each one was so different. Then one day, they were asked to count 2 more things than 10. They called the first one “eleven” or “one left over,” and the second one, “twelve,” or “two left over.” Then, they were called upon to count so much more that they needed to put the numbers together with 10. 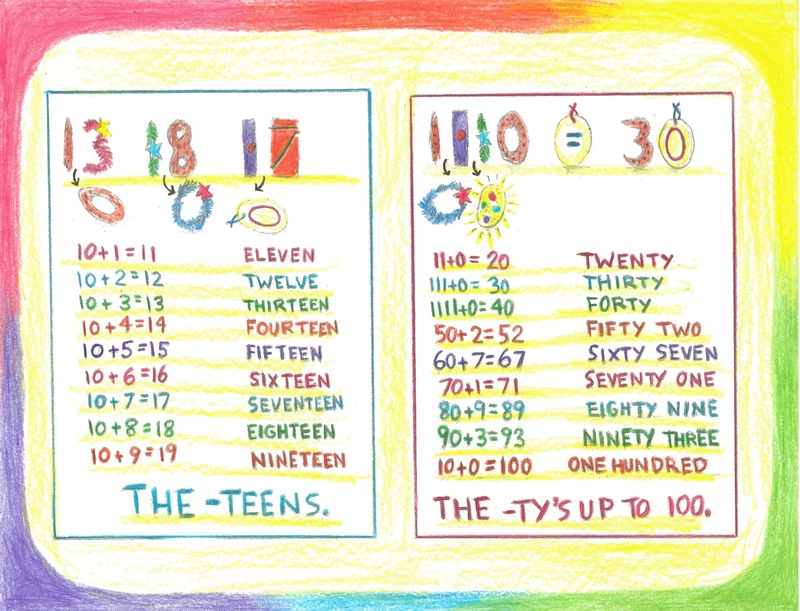 That’s how the -teens came about, with all the numbers having to stand next to 10. The numbers stood SO close together, that they squeezed the “0” out. Then the things that had to be counted grew and grew to be so many that the 10’s had to stand together, asking all the other numbers to stand there with them. These were called the -ty’s (say “tees”). So, twenty is two 10’s, and thirty is three. First, all of the “1’s” were squeezed out by the other numbers, then the other “0’s” were. So, for example, 3 10s became 30, and 3 10s + 3 became 33! Include all the numbers to 90, then say that one hundred is ten 10’s. No need to show all the numbers visually, just a sampling’s enough. 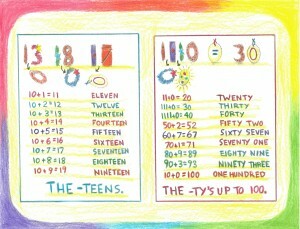 Be sure to use the Real Numbers as props, then go on to illustrate the -teens and -ty’s on separate pages. So the child is brought along slowly and carefully, in a very pictorial way. Lots of illustration and color make up the heart of this lesson and activity. The image below illustrates the story, using real numbers as props. The real numbers can either be placed as manipulatives above the written numbers or worked with separately, then drawn on the top of the page. (The three sets of real numbers shown can be found in the Math By Hand / Grade 1 / Kit 2 / Real Numbers. When teaching from the whole to the parts, there is no need to rush into abstraction. If the numbers are known in sequence and counting order, taking this “whole” apart can come a little later. But the lesson on -teens and -ty’s does build an excellent foundation for being able to do this, because of the fact that within any group of -ty’s numbers follow the known sequence (1-2-3-4-5-6-7-8-9). Knowledge ensues in an environment dedicated to imaginative, creative knowing, where student and teacher alike surrender to the ensuing of that knowledge as a worthy goal. More on the Common Core Grade 1 Number and Operations in Base Ten Standards along with their ambient counterparts tomorrow!